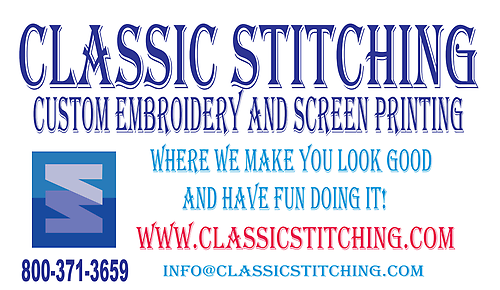 At Classic Stitching, we create and produce custom embroidery on virtually all types of clothing or hats, designed to your specifications and produced on your choice of garment. Now you can add a truly professional touch to your business or organization image with elegant custom embroidery, or screen printing instead of the usual iron-on transfer, which we can also do! We can produce in any quantity you want - from a single piece for a special grandparent to large production orders for sizable businesses. Classic Stitching is a wonderful choice for special events, family reunions, imaginative gifts, and other occasions where a memorable embroidered garment or hat would be treasured for years to come! If it is not a clothing item you want we also sell blankets, beach towels, lanyards and many other specialty items. Custom Embroidery - Silk Screening - Heat Transfers - Promotional Items - Bumper Stickers - Sign Making, Banners, and Vinyl Lettering for Vehicles!